Page revised in April 2019. Hadrian became emperor on the death of Trajan in 117 and soon after he started building a residence for his otium (rest/leisure, but also introspection) on a piece of land near Tivoli owned by the family of his wife Vibia Sabina. Hadrian spent twelve years travelling through almost all the provinces of the empire from Britain to Morocco, from Greece to Egypt and in the design of his villa he introduced elements which reminded him of the sites he had seen in his journeys. Villa Adriana (as the residence is called today) was not much utilized after the death of Hadrian. Its existence was already forgotten when the Roman Empire was still alive and for more than a thousand years it was used as a quarry and a location where goats would graze. First excavations aimed at finding statues and coins were conducted at the time of Pope Alexander VI. 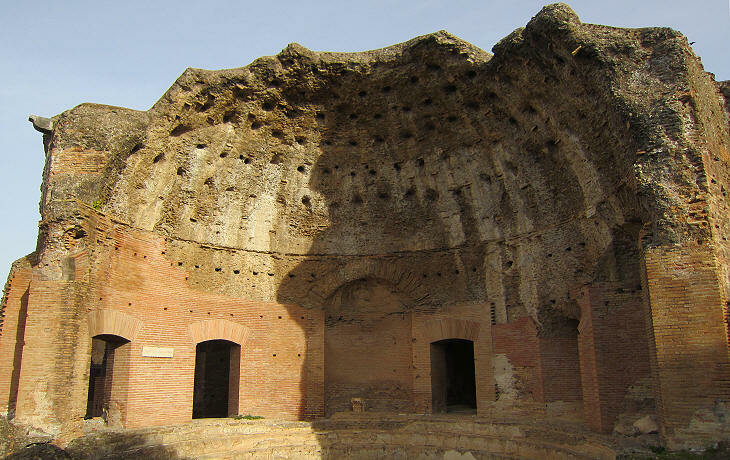 Villa Adriana has attracted travellers and inspired artists and architects. It became a "must see" for XVIIIth century Grand Tour travellers and an inscription celebrates the visit made by German Emperor Joseph II and his brother Leopold, Grand Duke of Tuscany in March 1769. 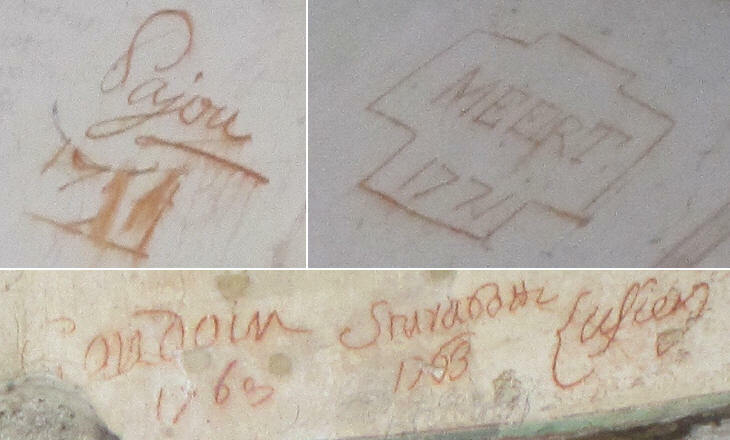 Other less famous visitors are remembered by their signatures on the stucco vaults of some buildings. The Fede family, to whom most of Villa Adriana belonged in the XVIIIth century, gave it its current appearance; they cleared the weeds and planted olive and pine trees and a long alley of cypresses. 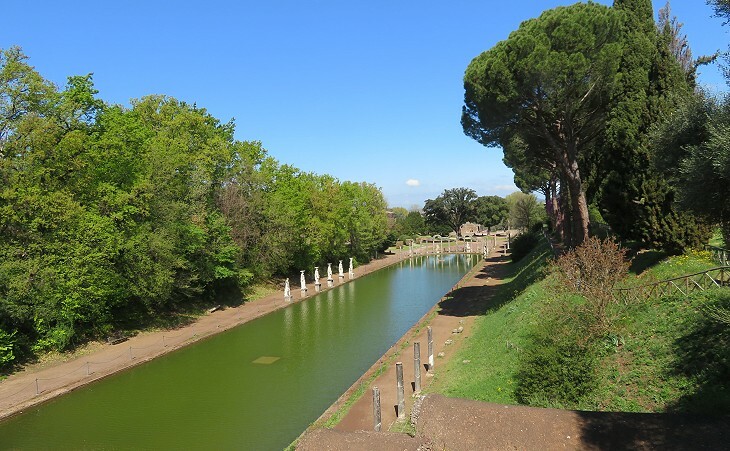 Although Hadrian had designed formal gardens, these trees induce the right spirit for visiting the villa; the ancient buildings, fountains and porticoes were not aimed at impressing, but more at eliciting feelings of harmony and peacefulness. In 1924 Marguerite Cleenewerck de Crayencour, a young Belgian lady, visited Villa Adriana for the first time. Nearly thirty years later, under the nom de plume of Marguerite Yourcenar, she wrote Memoirs of Hadrian, a novel about the life of the emperor which she first thought of during the mornings she spent at Villa Adriana. You may wish to see a page with excerpts from that novel and late autumn views of the villa. Villa Adriana is not a royal palace, but rather a university campus. Its terraces have different orientations; some have a view towards Rome, others towards Tivoli or the Castelli Romani. There is not an evident hierarchy among the buildings: the smaller ones are not aligned in order to emphasize the larger ones. It is evident by the many porticoes which flanked the terraces that Hadrian enjoyed wandering along them with his friends, as Aristotle and the other peripatetic philosophers used to do in Athens. At first sight one does not realize that the terraces are to a great extent artificial and are supported by imposing substructures which were used to house the many servants who worked at the villa. Trilithon (three stones - two vertical stones supporting a horizontal one) is a characteristic of the early architecture from Ancient Greece to Stonehenge and it applies in a more general sense to all buildings erected by placing large stones one upon the other. Trilithon was not much employed at Villa Adriana which is a celebration of Roman masonry skills and in particular of opus reticulatum, a thick wall made up of small blocks of tufa or bricks arranged along diagonal lines. Even where the design follows the Greek trilithon pattern, pilasters and entablatures have a brickwork inner structure. According to the reconstructed model of Villa Adriana, some buildings were preceded by a small porch having on top the traditional Greek triangular tympanum. As a matter of fact all these porches do not exist any longer, so that curved shapes definitely prevail on straight lines. In the Canopus even the classic entablature is disrupted; the new resulting shape is known as Serliana, after the Renaissance architect Sebastiano Serlio who described it in a treatise. Some of the buildings are decorated with white marble columns, but in most of them Hadrian (who regarded himself as a talented architect) departed from Greek canons as he made use of coloured stones: grey and pink granite from Egypt (as he did in the Pantheon) and green cipollino from a Greek island (as he did in the Library of Athens). Coloured marbles as well as curved shapes have led modern art historians to define the architecture of Villa Adriana as Ancient Roman Baroque as it anticipated some of the features of the XVIIth century style. Previous images of this page show Doric capitals in the Temple to Venus, Ionic capitals in the Naval Theatre and Corinthian capitals in the Canopus; Hadrian however did not limit himself to the standard three orders: he combined elements of the Corinthian capital with the lotus leaves of Egyptian capitals. 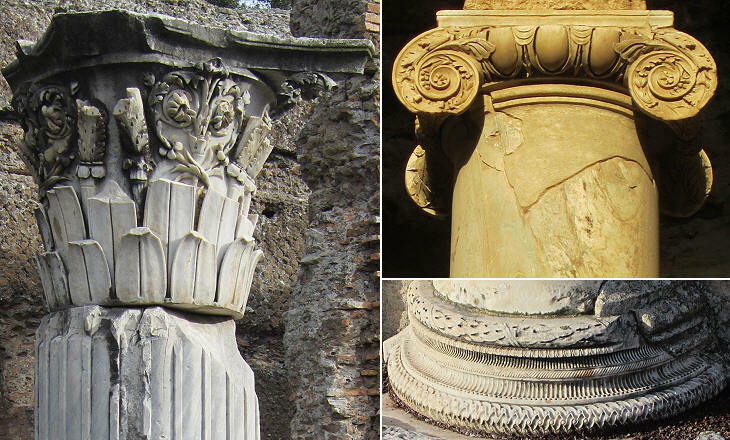 In the XVIth century Antonio da Sangallo developed a new design for the capitals which decorated his buildings, based on those he saw in Villa Adriana (see S. Maria in Porta Paradisi). Most of the main buildings were covered by domes and the passages between them had curved ceilings. For this reason Renaissance architects came to Villa Adriana to study this sort of real life catalogue of construction techniques; the gigantic dome of the Serapeum is a precursor of the rib vaults which are typical of medieval cathedrals (most likely Borromini had in mind this dome when he designed the interior of S. Ivo alla Sapienza). Giovanni Battista Piranesi was another artist who fell in love with the domes of Villa Adriana; he was the first to draw an accurate map of the site and several of his engravings show views of Villa Adriana (the following links to external sites show the Philosophers' Hall and the Serapeum - they open in separate windows). 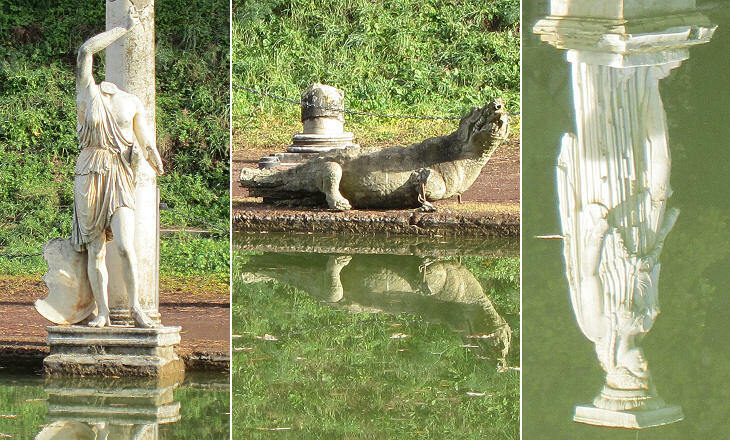 More than 250 statues and reliefs which decorated Villa Adriana are scattered in other locations, from museums around the world to villas built by cardinals. Hadrian's liking for colours can be seen in many statues in very hard to sculpture stones such as red granite (left) and basalt (right). 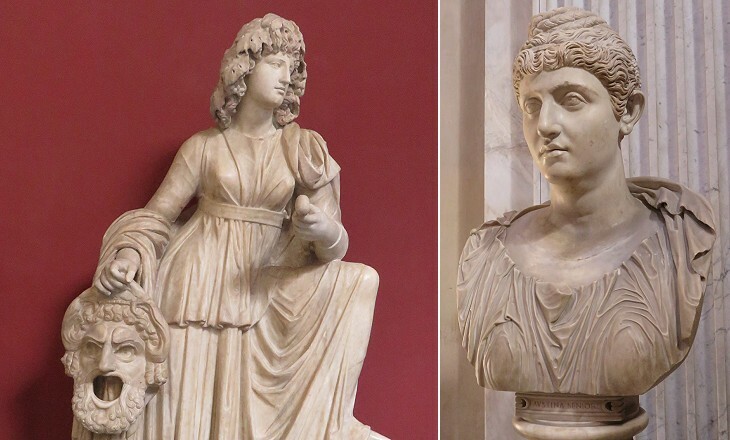 The emperor was born at Italica in Spain, into a family of Roman origin, but he was fascinated by Greek and Egyptian cultures and several statues at Villa Adriana portrayed classical figures in Egyptian attire. In 123 Hadrian visited Nicea, a town in Bithynia which had been struck by an earthquake. In the course of that visit or soon after the emperor met Antinous, a youth of great beauty, most likely of a very humble origin. For seven years Antinous followed Hadrian in his travels through the Roman Empire. He drowned in the Nile in 130, under mysterious circumstances. The grief of the emperor was such that he wanted Antinous to be deified, a honour which was reserved to members of the imperial family only. 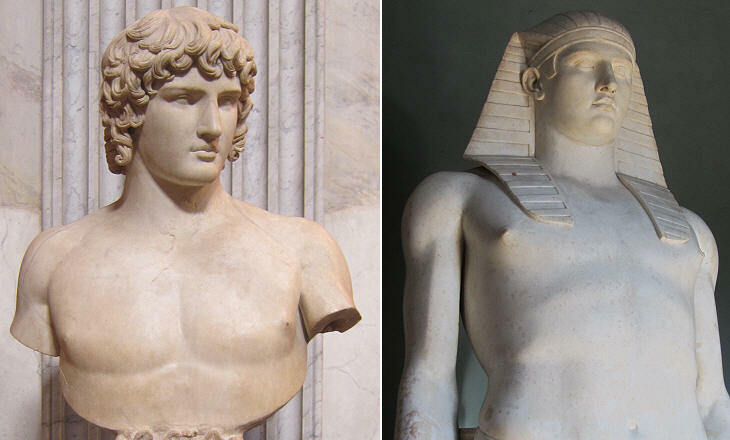 He ordered busts and statues of the young man to be sent to all the main towns of the empire to be worshipped in temples, thus Antinous has become an icon of ancient sculpture. In 2005 archaeologists have found evidence of a temple to Antinous (or perhaps a cenotaph) near the Canopus and they believe that the obelisk now at Pincio was erected at Villa Adriana. 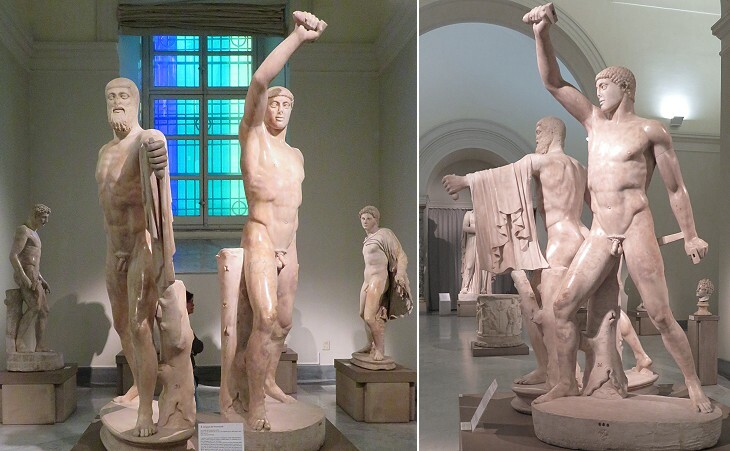 After WWII archaeologists found some other statues which presumably decorated the gardens of Villa Adriana. 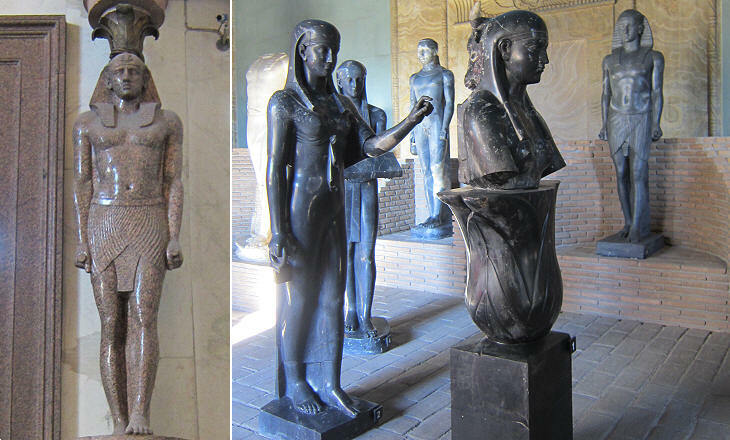 Copies of some of them were placed at the Canopus whereas the originals are on display at a small museum inside the villa. 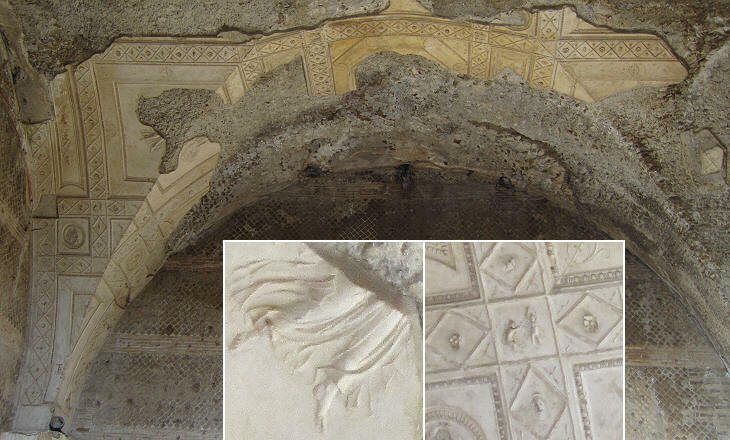 Overall the decoration of the walls, ceilings and floors of the buildings of Villa Adriana was based on geometrical motifs. 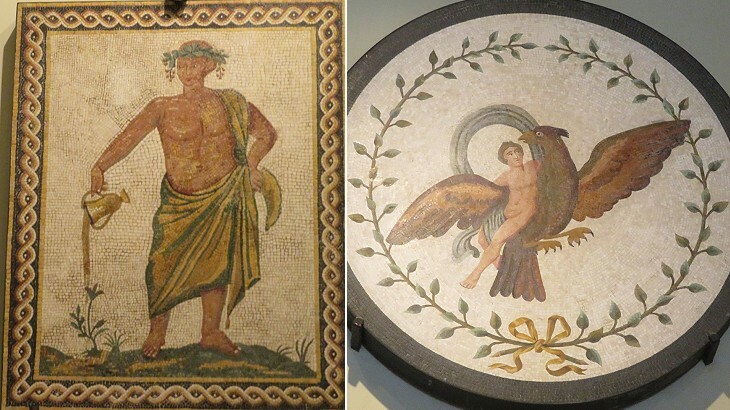 However a few emblemata, small mosaics portraying figures, were found "hanging" on the walls of some buildings as if they were paintings or at the centre of geometric mosaics on the floors (you may wish to see a mosaic found at Thysdrus in today's Tunisia showing the Abduction of Ganymede at its centre). The floors of the most important buildings were in opus sectile, an inlay made up of relatively large pieces of coloured marbles. Yellow and red marbles from Simitthus (in today's Tunisia) were utilized in addition to green cipollino and pavonazzetto, a stone with veins of different colours. 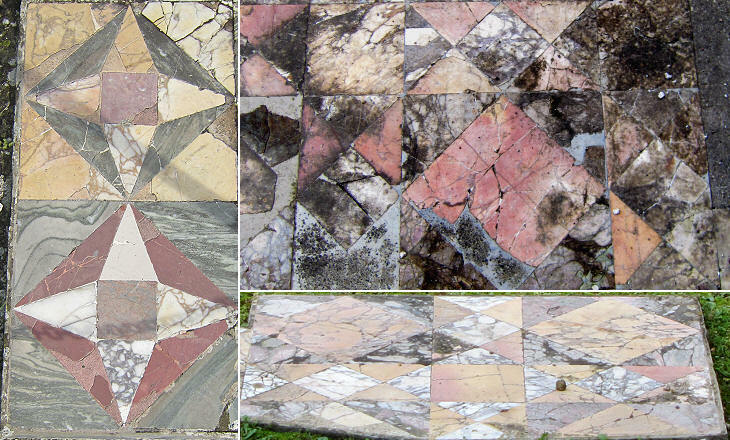 Similar marble inlays can be seen at Villa dei Quintili which was built a few years later. 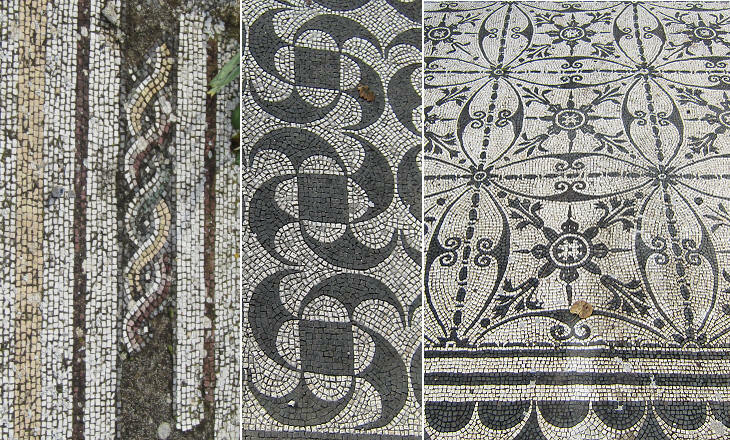 The use of mosaics for decorating floors was relatively limited with the exception of Hospitalia, a complex of small rooms where guests (not of the highest rank) were housed. Each room was decorated in a different way with mosaics made up of a central floral section surrounded by geometric motifs. Ceilings were all plastered; those of the underground passages were utilized by visitors for graffiti (until a few years ago). Those of the most important buildings were decorated with stuccoes based on geometric motifs and very small figures, similar to what was done with painted decoration which is almost entirely lost at Villa Adriana, but can still be seen at Villa di Livia. To run such a large complex of buildings required not only a crowd of servants and guards, but also well designed facilities to ensure that these people performed their duties without interfering with the life of the emperor and of his guests. For this reason a network of underground passages allowed the servants to move around the villa without even being seen by the emperor. The servants and the guards were housed in the substructures supporting the terraces or in buildings which were hidden by one of the many nymphaeums (large fountains) placed in the courtyards or the terraces. 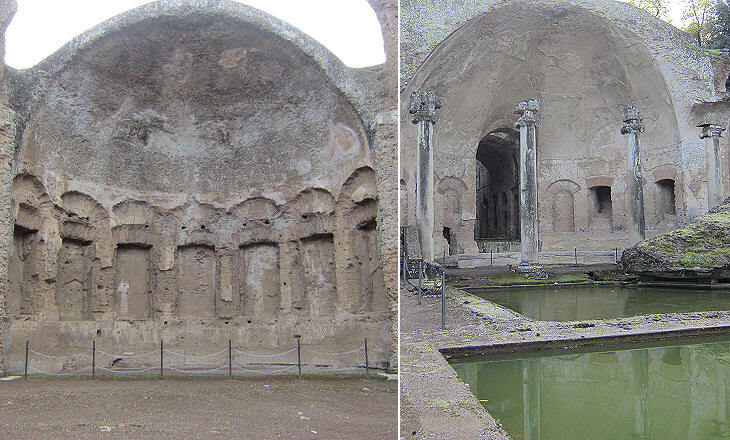 Villa Adriana could rely on an ample supply of water as it was located near the aqueducts which supplied Rome. Sadly Hadrian did not enjoy for long the villa he had so carefully designed; due to health problems he spent most of his last years in the imperial residence of Baiae near Naples, where he died in 138. 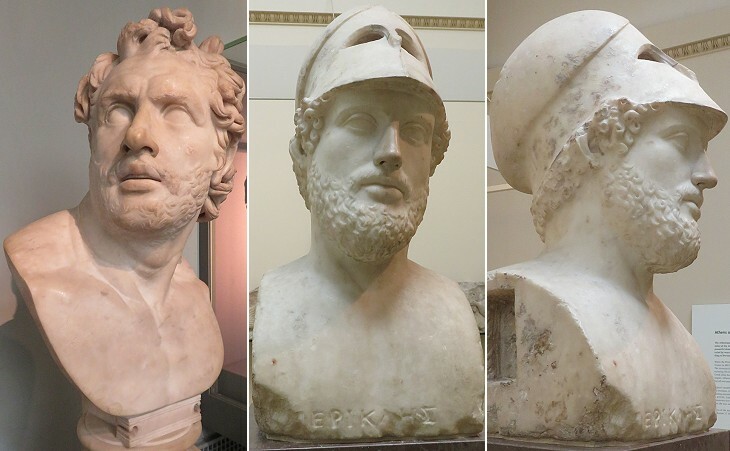 The image used as background for this page shows a bust of Hadrian found at Villa Adriana and now at the Vatican Museums. You may wish to stroll through Villa Adriana reading Memoirs of Hadrian or see it at night. Move on to the next step in your tour of the Environs of Rome: Palestrina.